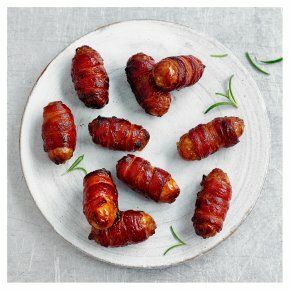 16 tender cocktail sausages, made from selected cuts of organic pork shoulder meat blended with herbs and spices, wrapped in dry-cured organic bacon. Our British organic free range pigs thrive in open fields, reared by a small, select group of farmers chosen for their high animal welfare standards and commitment to quality. INGREDIENTS: pork shoulder (63%), unsmoked streaky bacon (27%) (pork belly, sea salt*, sugar, antioxidant (sodium ascorbate*), preservative (sodium nitrite*)), water, fortified wheat flour (wheat flour, calcium carbonate*, iron*, niacin*, thiamin*), natural sheep casing*, salt*, nutmeg, ginger, black pepper, mace, mustard powder, thyme, antioxidant (ascorbic acid*), yeast*, chilli, sage.